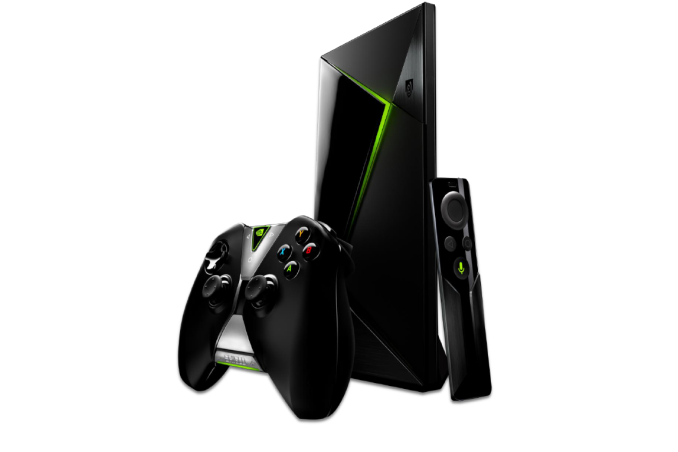 The NVIDIA SHIELD Android TV was launched back in May with the intent to dominate the over-the-top set-top-box (OTT STB) landscape. Premium features such as full HDMI 2.0a support and HEVC Main10 decoding enabled the coveted Netflix 4K certification. No other set top box (including the recently announced 2015 Apple TV and the Amazon 4K Fire TV) has anything close to the SHIELD Android TV in terms of advertised hardware and software capabilities. Our review, however, pointed out a few missed opportunities. Aside from the experience with Android TV as a software platform (something for which NVIDIA is not directly responsible), we had indicated that NVIDIA could have done a better job of codec licensing and configurability to cater to HTPC enthusiasts. Today, NVIDIA is announcing an OTA update to address some of those issues. Currently, the above set of features are available for use in the native Android Video and Photo apps. NVIDIA is working closely with third-party app developers (including Kodi and MX Player) to ensure that these media players will also be able to take advantage of the newly added features. The other important feature that is being made available is the ability to set the display refresh rate to 23.976 Hz. Currently, it is a static setting available under Settings > Device > HDMI > Resolution. Only 60 Hz (US) / 50 Hz (Europe) and 23.976 Hz are currently available, and the UI is also set to the selected refresh rate. However, NVIDIA expects third-party app developers to be able to dynamically alter the display refresh rate based on the content frame rate using the new APIs. This will be important since consumers should not be playing games or actually be navigating the user interface at 23.976 Hz. Syncing up the display refresh rate to the content frame rate should hopefully turn out to be a transparent exercise with the third-party apps. The new firmware also brings support for overscan adjustment (particularly useful for display sinks that tend to overscan, resulting in a cropped view of the interface). Most TVs don't need this. Other enhancements include native 4K rendering for select Android games (Beach Buggy Racing, Bombsquad, Hardwood Solitaire IV, Riptide GP 2, Kosmik Revenge, Video Poker Duel, Leo's Fortune, Machinarium, Meltdown, Never Alone, Samurai II, and Sky Gamblers: Storm Raiders), ability to transfer data between USB storage and a microSD card, ability to manually turn off the SHIELD controller and lowering the audio latency by as much as 40ms compared to standard Android. The last aspect is especially important for gaming, and it will be one of the prime reasons to pick up the update before checking out the GeForce NOW cloud game streaming service that is getting launched today. 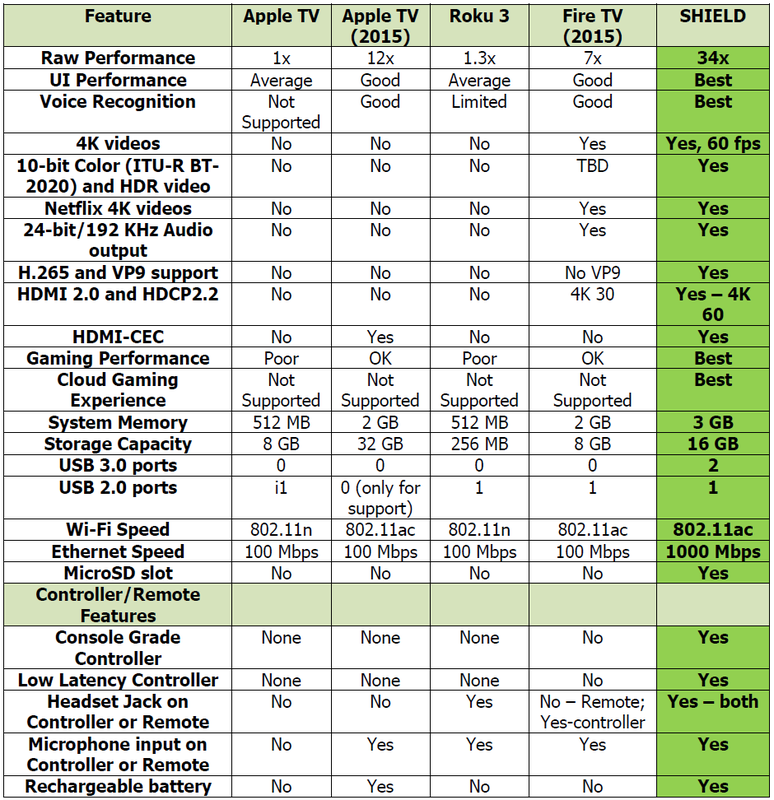 NVIDIA has also updated the table comparing the SHIELD Android TV to the competition. The latest version is reproduced below. As usual, these are NVIDIA's claims and need to be taken with a pinch of salt. We did go through the various aspects with concrete 'yes' or 'no' answers and the table seems to line up well with the actual specifications of the competitors' products. The SHIELD Android TV continues to justify the premium flagship tag despite recent entrants such as the 2015 Apple TV and the Amazon 4K Fire TV. NVIDIA's willingness to also focus on local media playback is good news for the general consumers as well as HTPC enthusiasts. For this reason alone, we can and do recommend the SHIELD Android TV over competing OTT STBs. "Adds pass-through support for Dolby TrueHD and DTS-HD Master Audio lossless audio*"
The * means that the app has to support it first. So Plex etc. have to be updated first. Any idea when this will be available? Mine still isn't showing up. its the only real 4k streaming box and it's being advertised as such.. Best buy picking this up will really push sales. It's very clear that the ShieldTV is the best media streamer on the market, by most measures. It only lacks HBO GO and Amazon video, and HBO GO is supposedly "coming soon" (promised since June). Thing is, the FireTV is literally _half_ the price. Oh, and it supports HBO GO and Amazon video, right now. Kodi runs great too.